GoPro overhauled its range of action cameras last year, adding more features to its ‘entry level’ point of view (POV) devices and further improving its top spec cameras to cement its reputation as king of the action cams. Granted, there are now plenty of rival offerings that aim to tempt buyers away from the biggest name in sports and action shooting, but few can compete with the level of features and image quality offered by the Californian brand. The Hero5 Session sits in the middle of GoPro’s current camera lineup, borrowing many elements from its bigger Hero5 Black brother (which has just been superseded by both the Hero6 Black and Hero7 Black), yet featuring the scaled-down simplicity and exterior packaging of the more affordable Hero Session. It may sound confusing, and there’s a big price disparity between the four cameras, but the key thing to note is that the Hero5 Session shoots in 4K at 30fps, like the Hero5 Black, while stills are captured at 10MP (as opposed to 12MP by the Hero5 Black) and it features GoPro’s ProTune feature for easier post-production editing. In short, it’s easiest to think of the Hero5 Session as a Hero5 Black lite, albeit one without the handy rear touchscreen or the professional-grade performance. GoPro knows its audience, which is why it can get away with offering a number of cameras over a range of prices with very similar features. But for those wanting professional touches, such as ultra-sharp image quality via an all-glass lens, excellent low light performance and 4K filming at 60fps, then the Hero6 Black is definitely the camera to plump for. That said, the Hero5 Session still manages to cram a hefty amount into its diminutive shell, including the aforementioned 4K at 30fps video resolution, ProTune options and other pro-grade features, not to mention voice control and excellent smartphone connectivity. It is a lot more expensive than the near identical-looking Hero Session, but that camera doesn’t support 4K video, nor does it sport voice control or the Superview, Linear and Narrow fields of view. Features-wise, though, it’s more useful to compare the Hero5 Session to its bigger brother, because side-by-side there’s very little to separate the two bar a slightly reduced frame rate at certain video resolutions, the lack of RAW and WDR still image files, and the much more user-friendly rear touchscreen display. The small differences in quality will be difficult to spot for anyone using the camera on a casual basis, but the fact that the Hero5 Session doesn’t have a rear screen or an interchangeable battery will be reason enough for those using their camera on a regular basis to jump to the more expensive Hero5 Black or Hero6 Black. The Hero5 Session really is a masterclass in simplicity, as this small cube (it’s only marginally bigger than pool cue chalk) features just two buttons and one side flap that houses the USB-C port and MicroSD card slot. The shutter button on the top also acts as a power-on switch, and will start recording video automatically (if the relevant settings are activated) when depressed. A much smaller, and infinitely more finicky button on the rear scrolls through the various menus and settings on the camera. It takes a little while to get used to one-button control, and there will likely be multiple shaky video clips of feet and sky captured as users accidentally record when they merely meant to power-up the device. However, things are much simpler when the Hero5 Session is linked to GoPro’s app, which acts as both the rear screen (for setting up shots) and as a hub for browsing menus and adjusting settings. Just behind the big red shutter button is a small white-on-black display that displays the mode (video, photo, burst, etc), the number of files recorded, the battery level and whether voice control and Wi-Fi are activated. If you don’t have your phone to hand this is also the only screen via which you can adjust and navigate menus, which isn’t exactly good news for anyone with imperfect vision, as it’s so small, although it remains bright enough to use in the dark. The Hero5 Session also comes with a small exterior housing – it can’t be mounted to anything without this. But, unlike previous chunky plastic coverings, this is simply a thin plastic jacket that sports GoPro’s recognizable mounting system at the bottom. There’s also a USB-C cable and a small selection of adhesive mounts to get you started, and in all honesty that’s all that’s really required with this miniature Hero. The camera itself is so small and light that it’s incredibly easy to stick it to the side of a bicycle helmet, for example, without the need for additional accessories. Regardless, the camera’s exoskeleton (GoPro calls it a frame) is compatible with the vast array of GoPro accessories, which cover everything from floating selfie sticks to headband mounts and much more. The fact that the GoPro Hero5 Session is essentially a small rubbery cube doesn’t do much for its aesthetic appeal, but it does mean there’s very little to go wrong. One of the complaints we had about the Hero5 Black chiefly surrounded its interchangeable lens cover, which became damaged on our test model and started letting condensation in. There are no worries with its smaller sibling, as the lens is neatly housed behind some reinforced glass that’s secured by eight robust little screws. In fact, the Hero5 Session feels like it can handle more punishment than its more expensive counterpart, and this is reflected in the fact that GoPro doesn’t offer any additional housing. Straight out of the box it’s waterproof to 33ft (10m), which makes it perfectly suitable for most water sports, while the small and lightweight build means it can be easily mounted in unusual places to capture cool angles. As previously mentioned, the lack of easily accessible settings can be a bit of a chore when you’re out and about, while the simple task of flicking between video and stills capture is more time-consuming than it needs to be. GoPro does throw in voice activation in this model, with the device responding to a list of commands such as “GoPro, take a picture” or “GoPro, turn off”; this makes switching between modes slightly easier, although if there are people around to hear you there’s the risk that you’ll appear to be muttering to yourself. We found tethering the unit to GoPro’s smartphone app to generally be the best way to tee up video and still imagery, and to adjust settings when out and about, but obviously this won’t be practical in all circumstances – not many people take their iPhone surfing. Unfortunately, with Wi-Fi and Bluetooth tethering going full steam we did find that the already-poor battery time was reduced considerably, and with no option to swap-out the battery filming sessions can be brought to an abrupt halt. 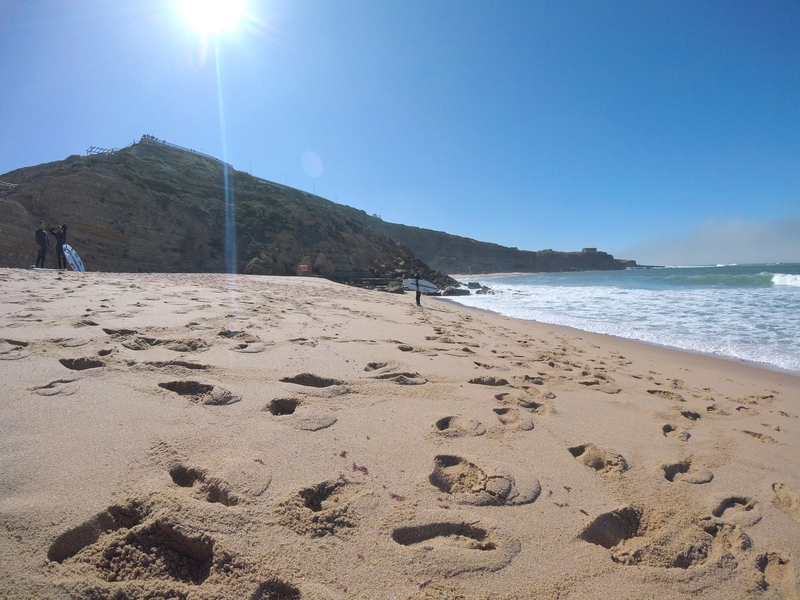 We spent a long time with the GoPro Hero5 Session, taking it on hikes along Portuguese cliff tops to capture the local surf, attaching it to a motorcycle and putting it to good use at a local skate park, and the results were always impressive. Granted, it can be annoying and fiddly to access menus using just the tiny screen atop the unit, but many users will find video and stills settings that work for them and just stick to those. Tethering to a smartphone is an easy solution to interface issues, but it does have an adverse effect on battery life. Regularly having to find a power outlet to charge the device was probably one of the most vexing aspects of our time with the Hero5 Session. The GoPro app is comprehensive, and allows for imagery and video to be browsed and downloaded to a smartphone for later editing in Quik Stories, arguably one of the simplest ways to produce engaging short films to date. This separate free app requires the user to feed in the desired clips and the software will then do all the hard work, offering a variety of edit styles, background tunes and font types to create neat short films that can be directly uploaded to social platforms. GoPro has a reputation for delivering some of the best video and stills image quality in the action camera market, and the Hero5 Session doesn’t let the side down. With ProTune, users can adjust color settings (GoPro Color or Flat for easier post-production), adjust white balance, shutter speeds, ISO limits and EV compensation settings to get the results they want. Unfortunately, all of this has to be done via the app, which can be time-consuming, especially if the Wi-Fi connection between camera and phone is proving temperamental, although a recent software update should have corrected this. There’s also a burst mode that fires off an impressive 30fps at 10MP, which should prove invaluable for those wanting to grab the perfect shot of some high-octane action. The same ProTune options are available for still images, while field of view choices include wide, with the classic GoPro barrel distortion, or Linear, which aims to reduce the fisheye effect. The resulting shots look good, but the lack of a raw format option will be slightly annoying for those who like to enhance their shots in editing software such as Lightroom or Photoshop. Also, the more expensive Hero5 Black features a WDR (wide dynamic range) photo mode, which uses a similar technique to smartphone HDR technology to create perfectly exposed snaps, and it’s sorely missed in this device. That said, footage recorded in 4K at 30fps is as smooth and indulgent as you’d expect, while there are multitude options of frame rates and resolutions to suit most situations. Colors appear bright and vibrant, with good contrast between light and dark areas, while numerous field of vision modes makes it really easy to capture the action. SuperView can feel a little extreme, but manages to cram in a remarkable amount of action for such a small lens, while the Linear and Narrow modes are good for those wanting to move away from the typical – and slightly tired – action camera POV. Finally, the additional noise reduction is noticeable, particularly during our high-speed motorcycle test, where the sonorous exhaust note was clearly picked out over the wind noise that usually blights action cams. The video and image quality captured by the smallest camera in the GoPro range certainly belie its pocket-sized packaging. Clips appear vibrant and smooth, while stills imagery is crisp enough to feature on websites and social media with little or no enhancement. A lack of a raw file option does reduce the scope for tweaking still images, but at the highest 10MP resolution shots are detailed enough to take into post-production software and print at a decent size. The footage from the Hero5 Session is at the very top of the action camera quality spectrum, with excellent color definition, top-quality audio and a bunch of professional features that see this model creeping up on its larger and more expensive Hero5 Black model. Granted, for those wanting full control over their video and the best image quality possible, the Hero5 Black or new Hero6 Black are the GoPros to go for, but the Hero5 Session is lighter and more portable than those cameras, and almost as good at capturing the moment. As an action camera to pack for your travels it’s very difficult to ignore, and as a back-up to support the Hero5 Black or Hero6 Black on larger shoots, and for capturing tricky shots where only a small and easily mounted camera can get the job done, it’s perfect. The lack of rear screen can be frustrating, the battery life is pretty poor and GoPro’s voice command system is a little erratic, but the lack of such features is reflected in the price – and what you do get for your money is pretty impressive.